The global flexographic inks market was valued at US$ 4.6 Bn in 2017 and is anticipated to expand at a CAGR of more than 4.0% from 2018 to 2026, according to a new research report published by Transparency Market Research (TMR) titled ‘Flexographic Inks Market – Global Industry Analysis, Size, Share, Growth, Trends, and Forecast, 2018–2026.’ Flexographic inks are manufactured by using various petrochemical-derived raw materials such as carbon black, mineral oils, resins, solvents, and other intermediates. Flexographic inks can be used on a wide range of substrates to obtain an excellent printing quality, irrespective of the substrate material. Flexographic printing is one of the most important conventional printing processes. It employs flexible printing plates to print on various substrates. Historically, flexographic printing was known as aniline printing, primarily because flexographic printing presses used inks based on aniline dyes. The flexographic printing process is mostly used to print on flexible materials including corrugated boxes, paper and plastic bags, folding cartons, milk cartons, disposable cups, tags, and labels. Printing plates employed in the flexographic printing process are made of plastic, rubber, or photopolymer. This assures high flexibility and longevity. Flexographic printing plates have raised images, which are rubbed against the substrate to produce the required image on the substrate. Flexographic inks are supplied to ink rolls through the ink reservoir. These rolls further supply the ink to anilox rolls, which monitor the ink and apply the ink in a required amount to the cylinder containing flexographic plates. These plates are pressed against the substrate to produce the required image on the substrate. Stringent regulations related to VOC emissions have forced ink manufacturers to comply with environment-related, health, and safety standards during the production of printing inks. The U.S. Environmental Protection Agency (EPA) has developed the ‘EPA Test Method 24’ as a standard test to determine the amount of VOCs in inks. Usage of inorganic solvents and toxic metals, such as cadmium, hexavalent chromium, lead, and mercury, in printing inks adversely affects the environment. Volatility in crude oil prices is another key factor likely to restrict the flexographic inks market during the forecast period. Crude oil is one of the major raw materials used in the manufacture of printing inks. Crude oil prices have been fluctuating significantly for the last few years, which has adversely affected prices of flexographic inks. In terms of type, the global flexographic inks market has been segmented into water-based, solvent-based, and UV-cured. The water-based segment holds a major share of the global market, due to low prices and eco-friendly properties of water-based flexographic inks. Based on application, the market can be segmented into packaging (including flexible packaging, corrugated containers, folding cartons, tags & labels, and others) and others. Packaging is the most common application of flexographic inks. The packaging segment accounts for a major share of the global market. Flexible packaging and corrugated containers sub-segments dominate the packaging segment. These types of packaging have been increasingly adopted in medical and food & beverages industries in the last few years. In terms of resin, the global flexographic inks market has been categorized into nitrocellulose, polyamide, polyurethane, acrylic, and others. The polyurethane segment accounts for the maximum market share, closely followed by the polyamide segment. In terms of region, the global flexographic inks market has been divided into North America (the U.S. and Canada), Latin America (Brazil, Mexico, and Rest of Latin America), Europe (Germany, the U.K., France, Italy, Spain, Russia & CIS, and Rest of Europe), Asia Pacific (China, India, Japan, ASEAN, and Rest of Asia Pacific), and Middle East & Africa (GCC, South Africa, and Rest of Middle East & Africa). Asia Pacific is expected to remain a highly attractive region of the global flexographic inks market during the forecast period. International players have increased their focus on Asia Pacific, as more than 50% the global population as well as emerging markets are present in the region. 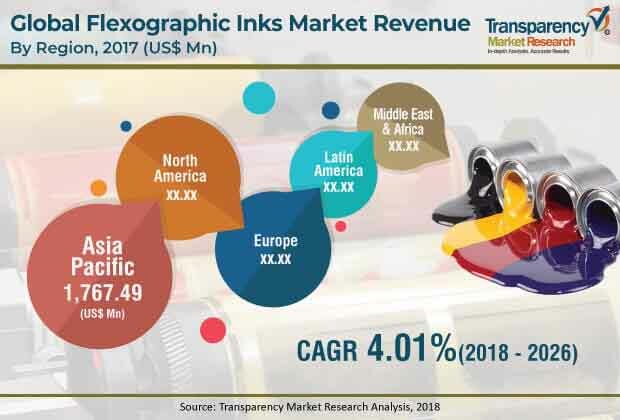 The market for flexographic inks in North America and Europe is more mature than that in Asia Pacific, Middle East & Africa, and Latin America. Key manufacturers of flexographic inks include Altana AG, Zeller+Gmelin GmbH & Co. KG, Flint Group, Sun Chemical Corporation, and Toyo Ink SC Holdings Co. Ltd. Inorganic growth has been a key strategy adopted by these multinational companies over the last few years. They have increased their market penetration by developing a wide network of distributors and suppliers. This has resulted in considerable competition for local players. Manufacturers are also focused on using different strategies for different regions. For example, in Asia Pacific, several established players have entered into strategic alliances with local players so as to consolidate their market share. In case of Middle East & Africa and Latin America, companies have focused on establishing research facilities to develop region-specific products. Manufacturers are focused on providing eco-friendly flexographic inks such as UV-cured flexographic inks in Europe and North America.